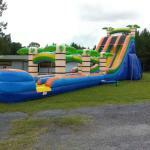 We have the following water slides available. These can also be rented for dry use. Click for details. 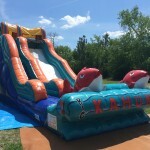 This Awesome 25ft Tropical Island Dual Lane Water Slide is one of the Fastest portable water slides the industry has to offer . This has wide lanes and there is unlimited fun to be had on this slide. 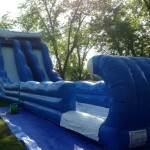 The amazing 27′ Pipeline™ Dual Lane Water Slide is one of the biggest portable water slides the industry has to offer . 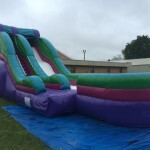 With the wide lanes, there is unlimited fun to be had on this slide. The amazing Big Kahuna is still one of the most popular water slides out. Come on and play with the fishes and ride the Big Kahuna! Grab your board shorts and get ready to ride the Wipe Out!! 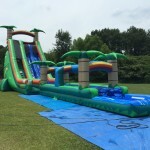 This is a very fast and fun slide, Great for all ages. Grab your Bathing Suit and set off to the Tiki Shores of Fun!!! 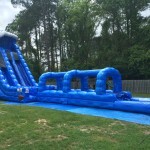 This is a very fast and fun slide, Great for all ages. 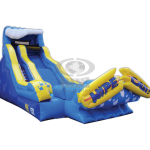 The 27′ Blue Crush 2 Lane Run ‘N’ Splash Combo features a radical sliding angle that’s sure to get the adrenaline pumping as riders scream down the 27′ Blue Crush Slide! 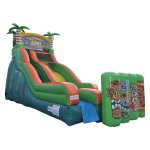 The 27′ Tropical 2 Lane Run ‘N’ Splash Combo features a radical sliding angle that’s sure to get the adrenaline pumping as riders scream down the 27′ Tropical Slide.